Partly cloudy. High 79F. Winds NW at 5 to 10 mph.. Partly cloudy this evening, then becoming cloudy after midnight. Slight chance of a rain shower. Low around 55F. Winds light and variable. You will no longer own a car. When you want to go somewhere, you will call a car service, which will have a vehicle to your door within just a couple of minutes. The vehicle likely will be electric, not fueled by gasoline. The car will be autonomous, that is, self-driving. Honda has announced it is paying GM several billion dollars for access to GM’s autonomous research, so there is little doubt that a lot of research has been committed to driverless vehicles, and most of those vehicles will be electric. Whether this research will ultimately succeed is hard to predict. There have been several high-profile accidents involving autonomous cars; it is far from clear that computers can be programmed in advance to understand every conceivable (and some inconceivable) danger and appropriately respond. The variety of road situations makes it hard to anticipate, and then program in advance, everything that can happen. And if a new situation arises that has not been programmed in advance, the outlook is bleak. Who will pay damages in a resulting accident? The manufacturer, the computer programmer or the insurance company? The author is a former senior executive of General Motors in charge of research and development, so his analysis of the auto industry obviously is accurate. His experience in trying to develop autonomous vehicles makes fascinating reading because he is as willing to discuss failures as successes. 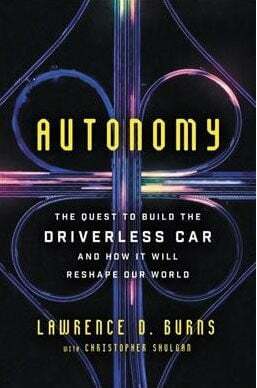 My takeaway from this book is that, despite Elon Musk’s Tesla experiments, it will be later rather than sooner that you, the reader, will actually experience autonomous electric cars. In the meantime, we should keep up-to-date on the progress, and this book is an excellent introduction. Alfred M. King is a freelance reviewer in Spotsylvania County.